SMITHFIELD, Va., Sep. 26 /CSRwire/ - Smithfield Foods, Inc. is pleased to announce the success of its employees’ collection efforts during Hunger Action Month™, a time when people across the country stand together with Feeding America® and its nationwide network of food banks to fight hunger. This month, Smithfield employees collected more than 45,000 pounds of non-perishable goods for donation, surpassing last year’s total of 15,000 pounds by 30,000 pounds. For ten years, Feeding America has organized Hunger Action Month to mobilize and encourage the public to take action against hunger in the United States, where one in eight Americans face hunger. In addition to food collection and volunteer opportunities, Smithfield participates in this hunger initiative by engaging its employees and sharing information about hunger relief with its locations across America. In addition to employee efforts during Hunger Action Month, Smithfield donated more than 230,000 pounds of protein to food banks this September through the company’s signature hunger-relief initiative, Helping Hungry Homes®, including 120,000 pounds to Second Harvest Food Bank of Fayetteville and the Food Bank of Central and Eastern North Carolina to assist in recovery efforts following Hurricane Florence. (Top Left Photo) Accounting employees at Smithfield Foods’ hog production division in Missouri pose with their donation for Hunger Action Month, a time when people across the country stand together with Feeding America and its nationwide network of food banks to fight hunger. (Top Right Photo) An employee at Smithfield Foods’ Middlesboro, KY facility stands with the facility’s donation for Hunger Action Month, a time when people across the country stand together with Feeding America and its nationwide network of food banks to fight hunger. 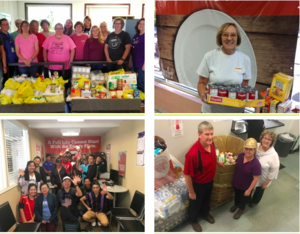 (Bottom Left Photo) Employees at Smithfield Foods’ Des Moines, IA facility supported Hunger Action Month, a time when people across the country stand together with Feeding America and its nationwide network of food banks to fight hunger. (Bottom Right Photo) Employees at Smithfield Foods’ Monmouth, IL facility are pictured with the facility’s donation for Hunger Action Month, a time when people across the country stand together with Feeding America and its nationwide network of food banks to fight hunger.